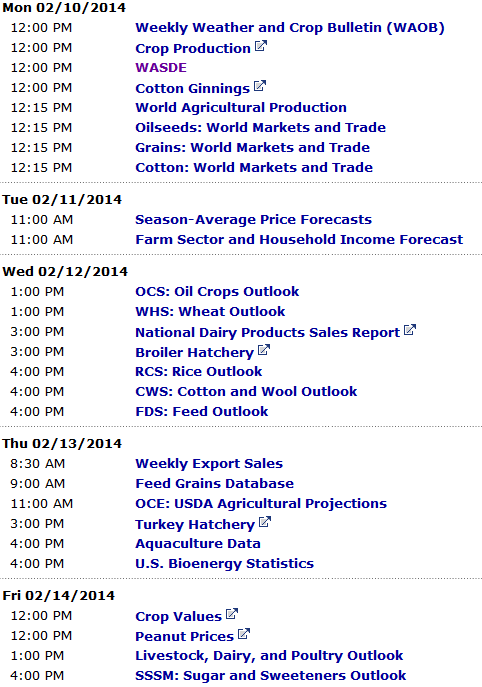 This is a sample entry from John Payne’s newsletter, This Week in Grain, published on Monday, February 10, 2014. 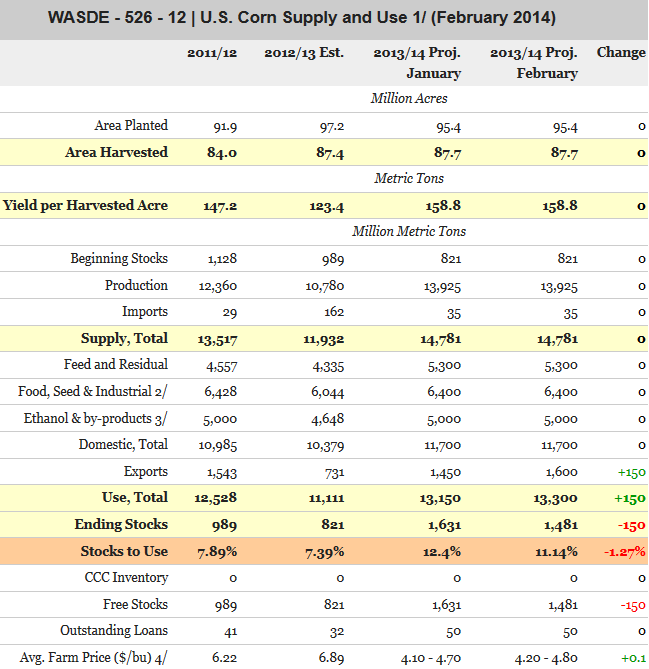 The USDA released their February WASDE report this morning (February 10). The February report is not normally a big market mover and the report followed suit as there were a few surprises, but not enough to get the corn, soybeans or wheat markets above resistance levels or below support levels…yet. If this were a horse race, I would call Wheat the winner, Corn as the show and Beans as the place. The carryout levels do not point toward that direction, but the changes in the carryouts do. CORN: The corn numbers qualified as a surprise in my opinion, as the carryout levels were lowered yet again from an expected 1.61 billion bushels to just over 1.4 billion bushels. This reduction is not huge in terms of current supply, but if you go back a month when many in the trade were thinking carryouts were going to be above 2 billion, things have changed substantially. This report did not touch on supply, only demand. The demand numbers were largely left unchanged, with an increase in exports being responsible for all of the carryout reduction. The reduction of carryout brings forward stocks to use levels back down toward 11%, which is much lower than we would have seen two months ago, but well above where we were last year at this time. The price action that followed the report was bullish, bringing prices up to the 449 level, but highs held and the market actually closed down to unchanged across the board. I spoke with several elevators across the Midwest after the numbers came out and most talked about a basis drop by the bigger players on the processing end. That is not bullish in my opinion and points toward lower board prices in the short term ahead. Corn bulls need to look at the lack of follow thru above 450 as a failure. If these kinds of numbers don’t get prices moving, it will probably need to come from a lack of planted acres or a weather problem down the line. Forecasts are improving across the much of the country, which should allow for an easier time moving product. In the end, I think the USDA numbers did more for putting a floor in the market at the January lows than it did to inspire a push toward 5.00. 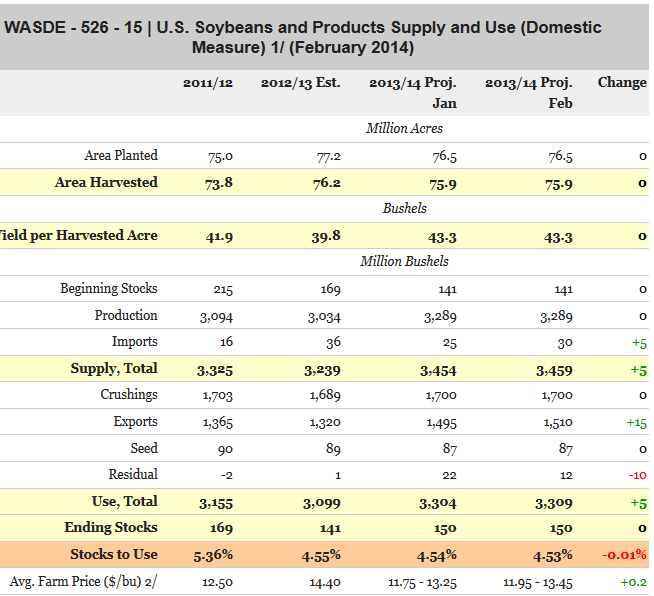 BEANS: The USDA did not budge on their numbers at 150 million from the January report. The demand numbers went up by 15 million, which would have brought down the carryout to 135 million, but it was offset by an equal increase of IMPORTS, offsetting any gains. Bulls were left banging their heads against the 1330 level in March again. I feel the USDA is showing their hand with this report, as I expect any supply drop in the future to be easily offset by importing of product from South America. This is not looking like a 2011 or 2012 market, as there is actually product in South America available for use and the market knows it. If the Chinese will not cancel our beans and move to South America, then it looks like the USDA sees us bringing in additional product to sell. In the end, the offset effect may be the same. This report could keep a lid on the old crop board until we get to a planting problem or if the USDA surprises to the downside on expected bean acres. The funds appear to be tapped out according to my latest OI numbers. The recent rally to January highs over the last two weeks (almost 75 cents in March) have me a bit nervous for bulls, as I do not know what will drive the next leg higher. Word was circulating today that almost 260,000 tons left Paranagua today for China. Will this lead to cancellations? We will see. Regardless, those long the board in March or long any bull futures spreads need to be aware of the vacuum under the market if it would get going in that direction. WHEAT: For the first time since early fall, the USDA did the wheat market a favor. Now, I want to be clear that the fundamental outlook for wheat is still bearish, but we are discussing the margins here, and on that front, things are improving. Wheat saw a small supply increase, but that was dwarfed by a big increase in exports and a smaller one in domestic use. 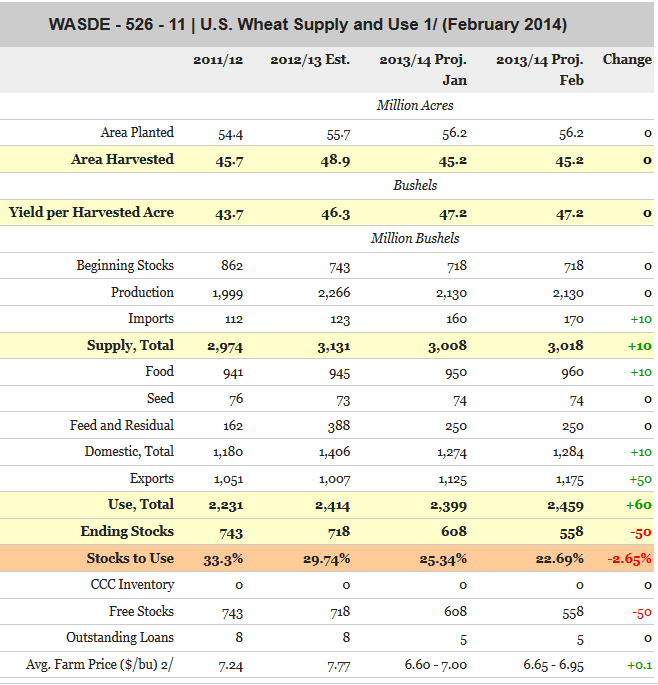 Stocks to use levels for all wheat classes are still at 22.63%, which is very high. On the report it wasn’t that bullish, but the market set up IS very bullish. Those short wheat as a speculation play now have something to think about. The real fireworks in wheat are about a month away when things start to warm up (please warm up!) and we get to see what this cold weather did to the crop. With KC stocks still tight I would not be surprised to see a short cover rally take prices up to 7 again as hedgers with profits look to step aside as they see what their yields look like. If you ever hear me on the radio, you will hear me talk about the “theme” of a market and how a market like wheat desperately needs the conversation to change. We may have seen a page turn this morning. Watch for a push over 640 in July as an inflection point. The schedule will be very light this week, with the exception of Chinese PMI on Thursday night and the Chinese trade balance report Tuesday evening. Soy traders will get crush data on Friday, but other than that the grain news releases will be limited to export reports until the AG forum (planting numbers will come out) on the 20th. Soy and corn traders need to keep ears open for any Chinese cancellations! Let’s see where new crop prices sit after today’s WASDE.